Every Australian Counts consultation: what housing do you need? This week we held a third consultation with women with disabilities about what they would like included in NDIS Fact Sheets for women. The interest from women has been strong, with the clear message coming across that women need to know how to use the system, and what they can do if things go wrong with its services. We've also heard that supporting rights to safety, parenting and health care are important to women. Our NDIS fact sheets will be launched on Thursday 23rd April 2015 at the Waves of Change Conference in Warrnambool. 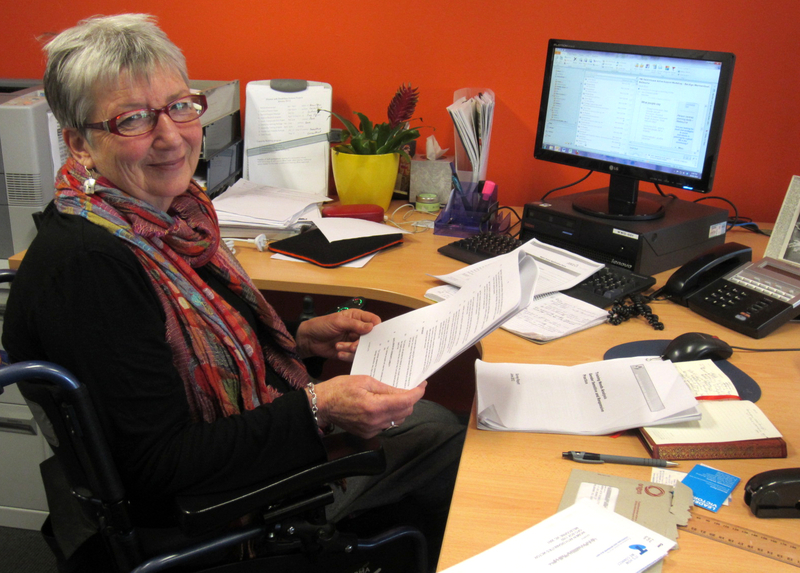 Last week we made a submission to the NDIS Information Linkages and Capacity Building consultation. This submission raised many of the same themes, around the role for the NDIS in upholding women with disabilities right to access women's services and how some of the programs that Women with Disabilities Victoria provides would fit well within the NDIS Information Linkages and Capacity Building Program. This consultation is also an opportunity for the NDIA to consider how it can build inter-sectoral relationships with women's services. The next step is to provide a submission to the NDIS Safeguards Consultation about the sorts of processes that the NDIS needs to protect the rights of people with disabilities, and to ensure that NDIS services are safe and respectful. If you have any ideas you want to submit on this theme send them to wdv@wdv.org.au. David Banfield Award for advocacy at HAS 2015. Georgia is a graduate of the WDV Enabling Women program from 2013. The WWDA Youth Network has officially commenced with the opening of the WWDA Youth Network Facebook page, www.facebook.com/WWDAyouth. The WWDA Youth Network aims to provide young women and girls with disabilities living in Australia with easy to understand human rights information; keep our followers up to date with events occurring in Australia and around the world relating to both women's rights and disability rights; introduce young women and girls to the stories of inspiring women with disabilities living in Australia; and engaging young women and girls to become empowered women. This Youth Network will continue to unveil exciting additions including a closed Facebook discussion group exclusively for young women 13-30 years; an Instagram feed and Youtube channel; and easy to read Youth section to the WWDA website. 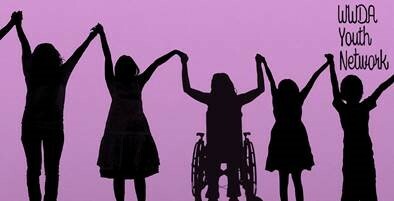 IMAGE: WWDA Youth Network image of women reaching for the sky holding hands. For more information contact COSHG. WDV has been working in partnership with Gateways Support Services in Geelong to deliver the WDV gender and disability training - "Human Rights & Quality Services: What does gender have to do with it?" Eva Sifis and Jax Brown, women with disabilities, co-facilitated this training with Emma Mahony (Women's Health and Well-being Barwon South West), Kristen Sheridan (violence prevention consultant) and Jesse Boccia (Barwon Centre Against Sexual Assault). Both WDV and Gateways Support Services have learnt a lot in our work together and training delivery has made the partnership stronger. 78 participants completed the training including 16 senior managers, 9 coordinators and 53 disability support workers. Rosemary Malone, CEO Gateways Support Services was amongst these participants because everyone at Gateways shares responsibility for respecting and affirming the human rights of men and women and children with disabilities. "Great it was presented by people with disabilities and hear their take on life"
"Got the picture of the whole situation and how much it (violence against women) can happen"
When participants were asked to list what actions they would take as a result of doing the training one participant stated - "Support any women I know in using their voice (with or without a disability)"
​Another participant said that the training "Reaffirmed the amount of power that we have (as workers) over our clients and how we must be mindful (constantly) how we use it." And finally "Thank you for a thought provoking and informative day"
As part of the Gender and Disability Workforce Development Program we delivered the peer Education Program “Women with disabilities: Our right to respect!” to women who use Yooralla services. The program has an innovative training setup, pairing a violence prevention and response worker and a woman with a disabilities, as co-facilitators. Samantha Winch, and Dagmar Jenkins (South East CASA) delivered the training in February 2015, with a dynamic group of women. The program aims to empower women to have respectful relationships, learn about their rights as woman with disabilities and what to do and where to go if they experience discrimination and violence. The program is about promoting gender and disability equity, and has the long term aim of preventing violence against women with disabilities. It was also a great opportunity to explore services in the area that can support women. Victoria’s Disability Advocacy Unit (DARU) brings the disability advocacy sector together for forums on burning issues. With the current community, media and political focus on both abuse of people with disabilities AND violence against women, the March forum was a timely opportunity for advocacy services to explore how these problems connect. Available via the DARU website there are transcripts, handouts, presentations and an audio recording of the forum. After an overview of how disability combines with gender to increase the risk of experiencing violence, the session introduced a range of support services available, and emphasised the importance of listening to women with disabilities. Attendees were asked to consider the role of the disability advocacy sector in responding to violence against women with disabilities. - Jacki, Advocate and Women with Disabilities Victoria Gender and Disability Workforce Development trainer. As a number of State and National inquiries into abuse of people with disabilities are happening, this is an important time for the disability advocacy sector to recognise how disability combines with gender - through our systemic and individual support work. Are you experiencing family/domestic violence? Or do you support & work with women who are? Want to find out more about DHS payments and services for those in crisis? • Possible payments and services available for people in crisis. The forum is free, but gold coin donations are welcome. Women with Disabilities Victoria is looking for a woman who identifies as having a disability, with some experience of supporting other people with a disability, to assist with the delivery of the 'Enabling Women Program – a Leadership Program for Women with Disabilities.' This role is for work in Warrnambool. The position description and program information can be downloaded from http://www.wdv.org.au. Interviews of short-listed applicants will take place in Warrnambool on the afternoon of Wednesday 29th April. The Centre for Adult Education (CAE) runs short introductory courses to help learners gain confidence and skills. These pre-accredited programs focus on creating pathways to accredited training or employment, and are supported by funds from the Victorian Government. Pathways For Women: Develop a personal set of goals for your future work and life and create a tailored plan for personal and skill development to help achieve your goals. Business Basics For Women (2014 Learn Local Award Finalist): A supportive and friendly introduction to basic business skills for women who want to set up a small, online or home-based business. For details or bookings call CAE 9652 0653 or email marie.baird@cae.edu.au. Want to train as a WIRE phone support worker/volunteer and support Victorian women? All interested trainees must attend an information session and a group interview. Please call 1300 134 130 to register your details to attend an info session and to receive an information pack in the mail. Read brochure. Women from different cultural and linguistic backgrounds with strong English language skills are encouraged to apply. Scholarships (for indigenous women, women asylum seekers and women over 50) and professional placements available. Web Telephone Support Worker Training Program. The Royal Commission into Family Violence is seeking written submissions on any issues relating to its terms of reference. It welcomes input from those who have experienced or who have come into contact with people affected by family violence and from any others whose experiences and ideas may assist the work of the Royal Commission. One of the Terms of Reference specifically mentions disability. It reads, "You are appointed to inquire into and report on how Victoria’s response to family violence can be improved by providing practical recommendations to stop family violence [in regards to] the needs and experiences of people affected by family violence with particular regard to children, seniors, Aboriginal and Torres Strait Islander communities, culturally and linguistically diverse communities, gay, lesbian, bisexual, transgender and intersex communities, regional and rural communities and people with a disability and complex needs. Women seeking assistance writing submissions are invited to contact the Royal Commission. The Commonwealth Department of Social Services and State and Territory Government Officials invite you to participate in our public consultation for a national framework on quality and safeguarding for the National Disability Insurance Scheme (NDIS). The consultation paper was released by the Disability Reform Council on 16 February 2015. A copy of the paper including an easy English version, factsheets and framework summary are located at: https://engage.dss.gov.au/ndis-qsf/. The consultation will provide an overview of the framework, and you will have the opportunity to ask questions and provide feedback. For Auslan interpreter or a hearing loop, please register and advise them 5 business days before the event. If you cannot attend a public consultation, you may wish to make a submission or join the discussion online. The closing date for submissions and other contributions is 30 April 2015. Recently, thousands of Every Australian Counts supporters emailed the head of the National Disability Insurance Agency to ask then to release their plan for housing under the NDIS. The response? The housing options paper prepared by the Agency over twelve months ago has been binned! The Every Australian Counts campaign team say, "It is taking too long for the governments to come up with a plan and so we are making our own – the Every Australian Counts DIY Disability Housing Plan." You can tell Every Australian Counts what kind of housing you need. They will compile all your responses and present them to the ministers ahead of their April meeting. The more stories they collect, the stronger the pressure for action. The Victoria Law Foundation would like to let you know about the award-winning legal website Everyday-Law.org.au, Everyday-Law helps Victorians better understand the law and their legal system by providing the best, plain language legal information produced by a range of organisations in one spot. Family, relationships and children - provides free, easy-to-understand information on a range of family law issues. It includes information on domestic violence, divorce and separation and child support. health and disability rights and services - including powers of attorney and guardianship. This is a free website and a Victoria Law Foundation initiative funded by the Legal Services Board Public Purpose Fund. The Australian Network for Universal Housing Design (ANUHD) and Rights and Inclusion Australia have written a position statement on the critical features needed for Australian housing to be accessible. WDV and Domestic Violence Victoria endorsed this statement and other organisations and individuals are invited to also endorse the paper. We know accessible housing is especially important for women with disabilities who need options to escape family violence. In 2010, Australian housing industry leaders agreed to provide minimum access features in all new housing by 2020. With a few exceptions, the housing industry has not responded. Less than 5% of the 2020 target will be met unless these features are regulated. Regulating these minimum access features will allow many more people to stay in their homes, and to visit others—regardless of their age, disability or life circumstances. To see and endorse the statement contact: anuhd@anuhd.org. 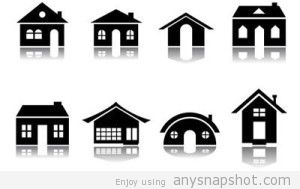 IMAGE: a variety of houses. Australia’s human rights record is scheduled to be reviewed by the UN Human Rights Council in 2015. Each country is reviewed once every four years by other countries at the United Nations. A Joint NGO Submission has been prepared with input and endorsement by many organisations including WDV. Australia should adopt national uniform legislation prohibiting the use of sterilisation of children, and of adults in the absence of their prior, fully informed and free consent. Australian should commission a National Independent Inquiry into Violence and Abuse Against People with Disability and Mental Illness in Institutional and Residential Settings. Australia should adequately fund the National Plan on Violence Against Women and Children, including women-specific services, and establish an independent mechanism to evaluate the implementation of the National Plan. 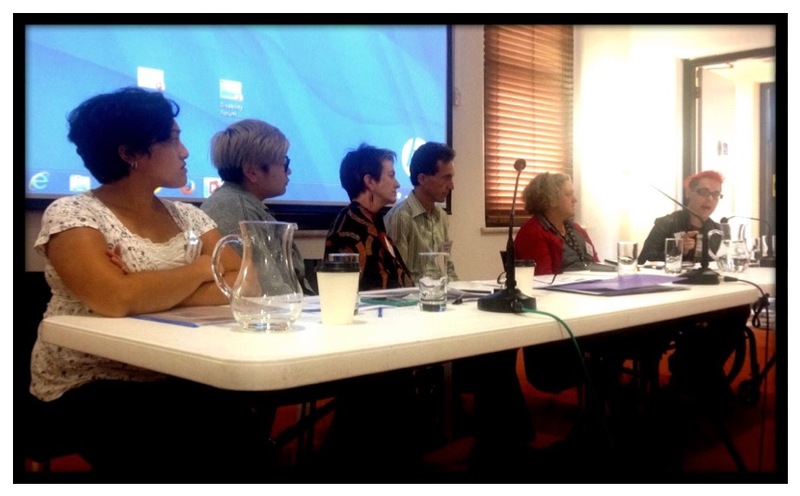 The 2015 Lesbian, Bisexual and Queer Women's Health Conference was held in Melbourne on March 27. The conference aimed to build the capacity of those working to improve the health and wellbeing of lesbian, bisexual, and queer women. A range of speakers shared research and practice wisdom regarding service considerations when supporting lesbian, bisexual, and queer women. 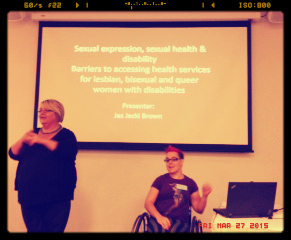 Disability advocate, Jax-Jackie Brown (pictured) made a presentation on the barriers and rights to accessing health services for lesbian, bisexual and queer women with disabilities. She said, "Disability is radically under represented in every circle, including in the Queer community... People with disabilities are are part of a group that is discriminated against, just as the Queer Community are." Melbourne Lawyer and WDV Board Member Catherine Brooks wrote about finding the pluses to coming out with a disability at work. Extracts follow. I previously hid the fact that I have multiple sclerosis because I feared workplace discrimination. Pretty ironic really, given that I’m an accredited specialist in workplace relations law. I just never wanted the situation to arise where someone thought, 'I’m not going to give Catherine that file/new matter/new client because of her disability', or 'we'd better not put too much pressure on Catherine as it might exacerbate her illness'. I was worried I’d miss out on opportunities. I feared it would affect my career advancement (hence why I’m writing this after I was made a partner). Read the full article in Lawyer Weekly. 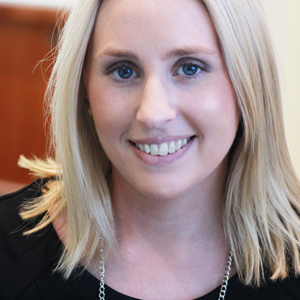 Catherine Brooks (pictured) is a principal at Moores in Box Hill, Victoria.